Today was a day we decided we needed to get out of South Orange County. 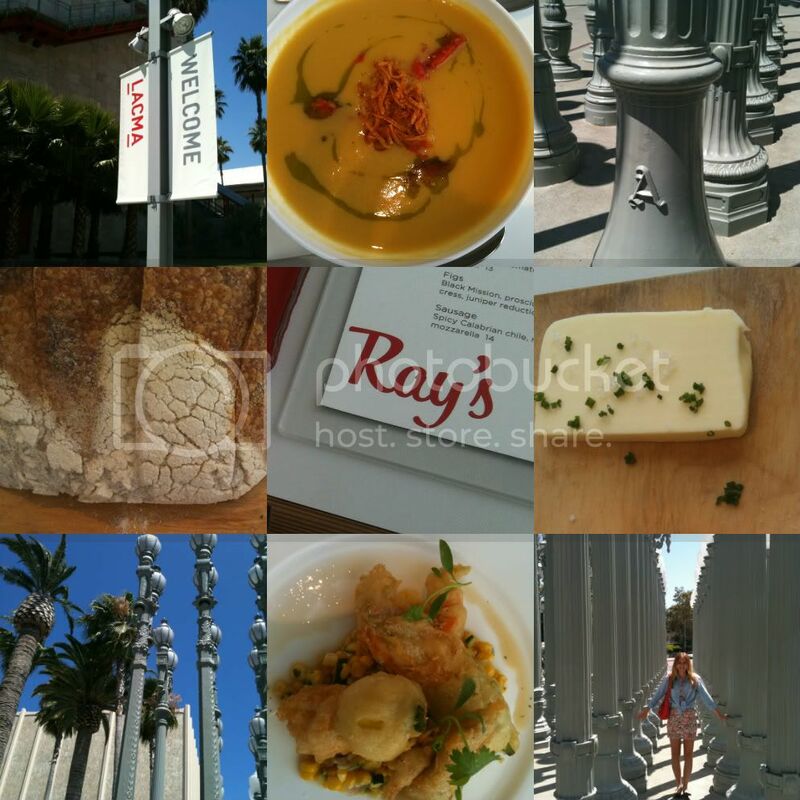 We had the most amazing lunch at Ray's at the LACMA. It's only about 65 miles, but with LA traffic the trip took almost 2.5 hours, so we were very hungry when we arrived at Ray's. When you are extremely hungry, it's not a bad thing when they bring out bread and butter to start. We devoured that and then ordered two appetizers. A corn soup that was so creamy, almost velvety and topped with crispy potatoes. Next up was a squash blossom dish that was stuffed with delicious goat cheese that was lightly breaded and it just oozed out and over a bed of sweet corn salad that was slightly chilled. We hardly needed our main course which we split. It was a truffled rice with arugula and a porcini sauce. LACMA is a wonderful place to spend an afternoon and we could not have been happier with our restaurant selection. Service was impeccable too! (note: all photos taken with my iphone). Amazing pics a and I love the collage you've put together. I love the typography of " Ray's " too. lovely photos annie. love the A on the lightpost. is that madeleine? how cute! the food sounds delicious too. Beautiful collage of photos Annie. The food looks delicious...the Vancouver Art Gallery has a great cafe as does the Getty...nice to know that museums and gallery's can offer tasty and nourishing food after they have have whetted our appetites with art! I love your blog. I'm glad I find it. Where on the east coast were you from? It looks like you had a wonderful day out! The food looks delicious! Yum this looks amazing! The bread especially! Sounds like the perfect day to me! Yum! that soup makes my mouth water:) have a great week! it looks and sound divine Annie...lovely pics! What a fun day! I'd love to try ray's..